Matthew Snyder applied for the job of superintendent in Cheraw, Colorado. The school board liked him (and the idea of saving money) so much that it asked if he&apos;d serve as principal too. Matthew Snyder sinks into the chair in his office with a tattered purple carpet and running trophies arranged in a corner. It is well before dawn and students won&apos;t start streaming past his window for at least another 45 minutes. By 7 a.m., though, he is fielding a phone call from a parent with a sick kid. He welcomes into his office two sophomores seeking approval for a Future Business Leaders of America project. The math teacher wants to talk, and so does the school counselor; one of his board members rings on the phone. Buses for a field trip to a dinosaur museum have to be sorted. Then a mother needs help enrolling her son in the neighboring district&apos;s alternative high school. 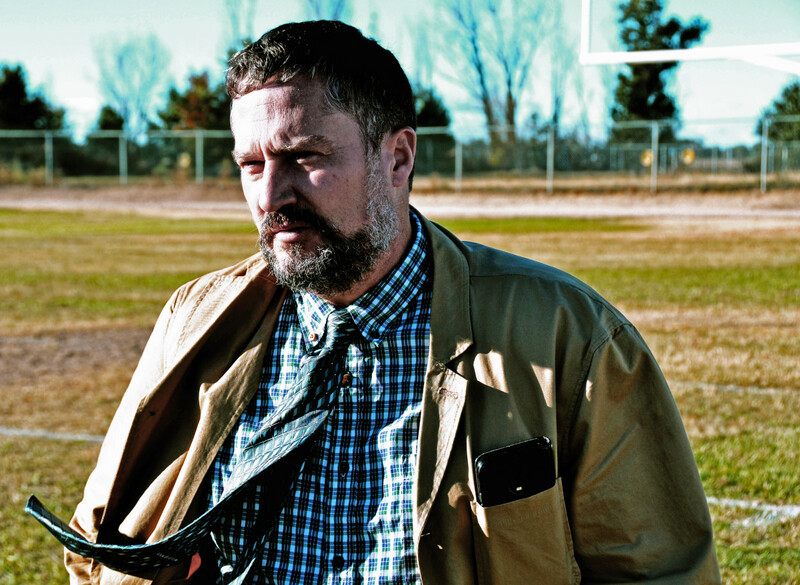 Snyder is the principal of the elementary, middle, and high schools in this tiny town in southeastern Colorado. At least that&apos;s one of his jobs. He&apos;s also the superintendent of the district of 225 students, as well as the maintenance director (until the school board can replace the person who quit the month prior), a substitute teacher, and, once he gets his license, a fill-in bus driver. Rural school leaders have some of the most complex, multifaceted jobs in education. They also have some of the highest turnover. Half of all new principals quit their jobs within three years, according to a 2014 study. 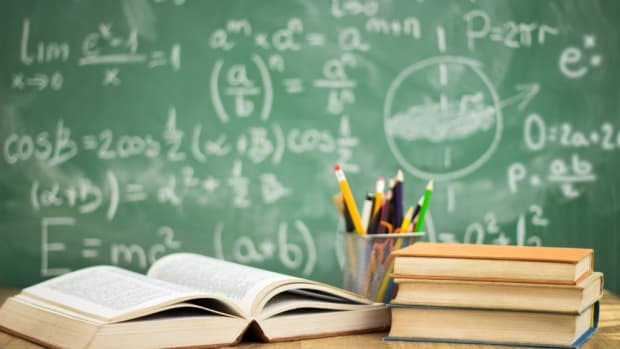 A national survey released in July found that principals in rural school districts are even less likely than their urban and suburban counterparts to stay at their school the following year and more likely to leave the profession altogether. The schools they preside over, meanwhile, often struggle with persistent poverty, low college-going rates, and extreme racial disparities in student outcomes. In Colorado, which has long scrambled to plug teacher shortages, education officials are now increasingly turning their attention to attrition among school leaders in the front office. This year a record 45 districts—roughly a quarter of those in Colorado—welcomed new superintendents, says Denille LePlatt, director of rural services with the state education agency. "Any time you are talking about trying to find the next generation of leaders for schools in rural areas, it&apos;s a real challenge," says Allen Pratt, executive director of the National Rural Education Association. "A long time ago principals used to stay 20 or 30 years, and now you&apos;re looking at a three-to-five-year window before they move up to something else." 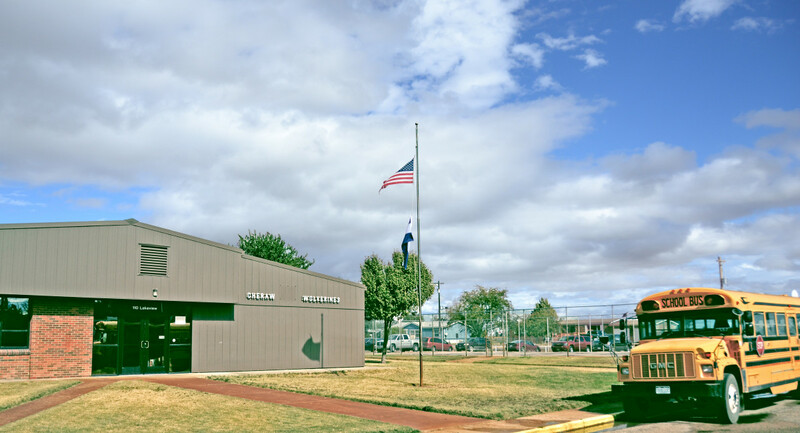 The school district of Cheraw, Colorado, educates 225 students, roughly half of whom transfer in from other districts through the state&apos;s open-enrollment policy. Luring principals and superintendents to small towns like Cheraw is difficult unless they have ties to the community or a rural background, LePlatt says. 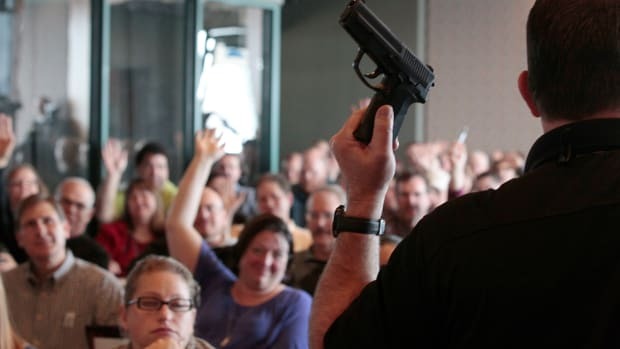 So, state and local education leaders are trying to groom people from rural areas for these jobs and offer training and support to help them stay. The 45-year-old grew up in a town in northern Colorado not unlike this one, he says, though there were mountains instead of flatlands and the local farms grew "potatoes instead of melons." His father was a principal who rose to superintendent, and although Snyder headed off to college at Colorado State University with the intention of becoming a doctor, he eventually switched to education studies and became a chemistry teacher. After getting the offer, Snyder, who is straightforward and sincere with a dry sense of humor and a salt-and-pepper beard, wasn&apos;t sure what to say. For advice he called his brother, a superintendent in a district down Highway 50, past budget hotels and fields thick with pumpkins. He also called a dual superintendent-principal he knew in Granada, Colorado. "He told me, &apos;If I can do it, you can do it.&apos;" A few days later, Snyder accepted the job. Colorado&apos;s state education agency is aiming to help these dual-role administrators (a job once described as a "position born in purgatory") and this summer brought them together for a networking and training event. The agency is also trying to reduce some of the burdens on small districts by easing reporting requirements when possible, LePlatt says. 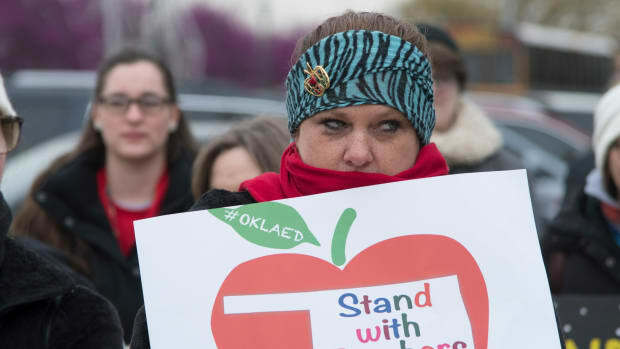 Meanwhile, districts of all sizes are coping with meager budgets (the state ranks 42nd in the nation in per-student funding and 46th in terms of teacher pay). In November, voters rejected a ballot initiative that would have raised corporate taxes and personal income taxes on high earners to pay for schools. A month and a half in, Snyder is frank: The job doesn&apos;t exactly feel doable. But he&apos;s chalking much of that up to being new. "The light at the end of the tunnel for me is I&apos;m hoping this is just adjusting." Around 10 a.m., Snyder heads out of his office and into classrooms. The science teacher is speaking to a room full of high schoolers wearing pink football jerseys for breast cancer awareness week. Back when Snyder was a science teacher, he taught physical science and chemistry. 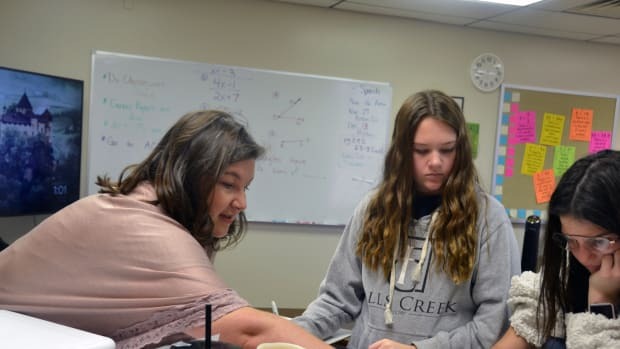 But Cheraw&apos;s science teacher leads classes in biology, chemistry, eighth-grade science, seventh-grade science, Earth science, and physical science—and Spanish. 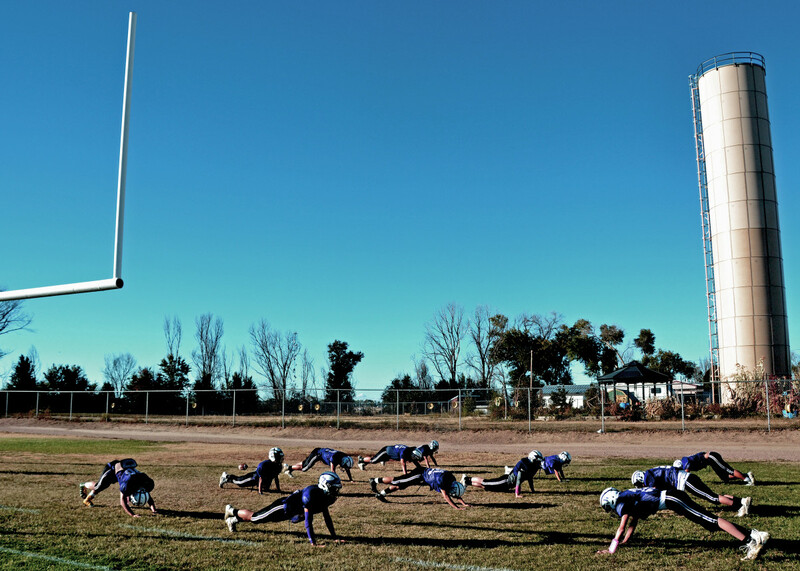 High schoolers practice on the football field in Cheraw, Colorado, a century-old town whose economy is based primarily around agriculture. Next, Snyder joins a cluster of teachers in the hall. The conversation turns to a family who has been completing their child&apos;s homework assignments. One teacher proposes gingerly talking to the student&apos;s mother and giving the child time to finish some homework in school. "Thanks for having a plan in place," Snyder tells the teacher before heading off to the elementary school wing. "I think that&apos;s great." Guiding teachers is perhaps the most critical part of an administrator&apos;s job—but that wasn&apos;t always the case. Principals used to be essentially building managers, chief disciplinarians, and the faces of their schools. But in the last few decades, state and federal education legislation began to hold them accountable for students&apos; academic successes and failures, turning principals and superintendents into "instructional leaders" tasked with shaping curriculums, coaching teachers, and refining pedagogy. Today, research suggests that school leadership can have a profound impact on student learning. But as school leaders&apos; jobs have expanded, training and support haven&apos;t kept pace, and many of these administrators struggle to make time to oversee instruction. But developing school leaders isn&apos;t a cause championed by the Trump administration, which proposed wiping out the $2 billion federal program that supports professional development for educators before Congress salvaged it. "We&apos;re in a holding pattern," Shellinger says. Snyder says he likes to get into classrooms when he can, and he will soon conduct formal teacher observations for the state&apos;s evaluation system. One of his biggest tasks is to boost the performance of the elementary school, which has been dinged by the state education agency for low test scores. Overall, the school district ranks slightly below state averages, and it has sent roughly 70 percent of its students off to two- or four-year colleges in recent years. "I&apos;ll be surprised if we can&apos;t turn it around in a year," says Snyder of the elementary school as a swarm of kindergartners passed him in the hall on their way to a reading intervention class. 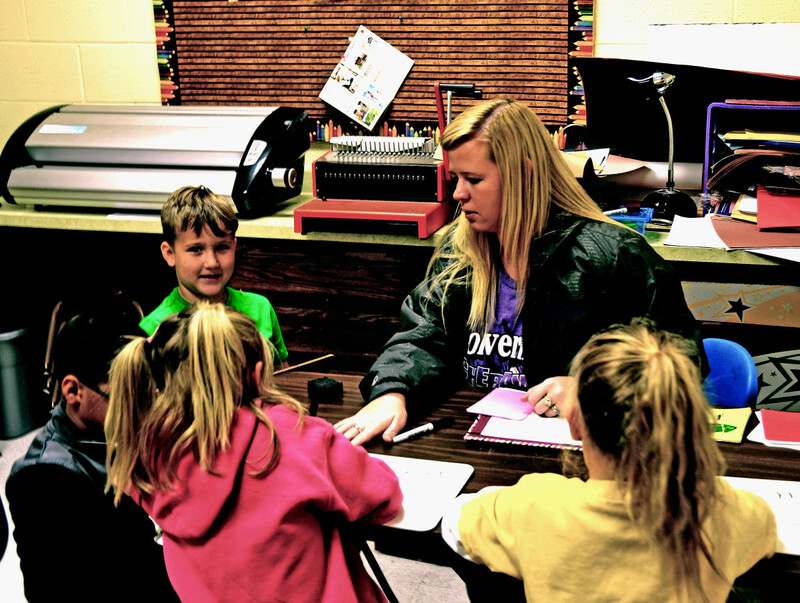 Kindergartners get help with reading in Cheraw, Colorado. The district is working to improve results at its elementary school, which has been underperforming. The school&apos;s tattered purple carpet? There&apos;s asbestos beneath it and Snyder needs to figure out how he can find the money to tear it up and have it replaced. The maintenance chief? 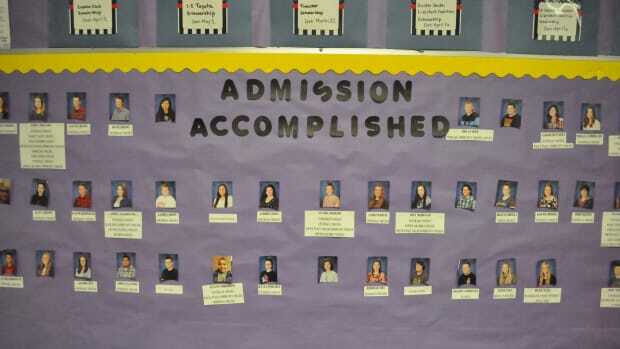 No one has so far been willing to accept the job at the $35,000 salary the school is able to pay. Snyder has spent days trailing a Honeywell HVAC worker, trying to make sense of the school&apos;s aging machinery. As for the big binder on his desk, it&apos;s been the thorn in his side since the first week of school. His district got ensnared in regulations while trying to contract out its food services and he&apos;s been trying to sort out the mess ever since. In the cafeteria at lunchtime, Snyder catches up with his wife (who fills in for teachers and whatever tasks the school needs doing) and says hello to kids as they lean over plates of pizza, corn, spaghetti, and meatballs. Cheraw feels like a community stuck in time, with young and old alike addressing people as "Sir" and "Ma&apos;am." Megan, a freshman who started at Cheraw this fall, recalls sitting alone in the cafeteria one recent day when Snyder, a father of four, came over to sit with her. He asked how she was adjusting and which school activities she might get involved with. "I told him this year I just want to settle in," she says. "He&apos;s encouraging, he&apos;s nice, he&apos;s a good man." Sierra, a sophomore, lives about 30 miles away on Highway 50 but chose Cheraw for its small size and to escape the cliques in her old high school. She&apos;s not alone: About half of the school district&apos;s students live outside its boundaries but attend through the state&apos;s open-enrollment policy. Other states have taken steps to merge tiny districts like Cheraw to save money, but in Colorado these districts survive by turning to other cost-cutting measures, such as four-day school weeks. 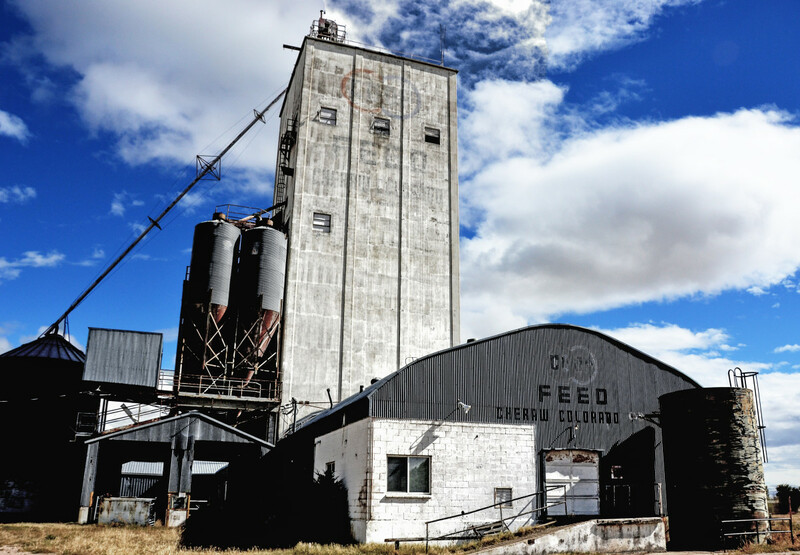 An old grain elevator in Cheraw, Colorado. Back in his office later that afternoon, Snyder gets excited to use his Spanish, acquired during a year volunteering in Puerto Rico, to discuss a student&apos;s academic struggles with his mother. Back in Lamar, he often used the language, but Cheraw has far fewer Latino students than many neighboring districts. At 4 p.m., Snyder is outside, fixing a flag that&apos;s gotten snared on the flag pole and chatting with parents picking up their kids. He walks to the football field behind the school to talk with the athletic director about a student who has been benched for poor grades. By 5:10, he&apos;s back at his desk and deep in his email. Now it&apos;s quiet save for the squeaking sounds rising from the gym across the hall, where the girls&apos; volleyball team is practicing. Staring at his computer with weary eyes, Snyder says, "A lot of times I just keep clicking until I nod off." But today he still has a few more things to do before tomorrow&apos;s meeting with the board. School&apos;s out on Fridays, and Snyder typically uses the day to do administrative tasks and support the students at sports games. This Friday, he&apos;ll be back in his office at 5:30 a.m. to prepare for his food services presentation. "Last year as a principal I felt like my hands were so tied. Every time I tried to do something, someone would come back with questions," Snyder says. "Now I don&apos;t have to ask someone for permission to do something in my building. That&apos;s kind of nice. I feel free. I don&apos;t know how else to explain it—I feel free." This story about rural school principals was produced by the Hechinger Report, a non-profit, independent news organization focused on inequality and innovation in education. What Are American Schools Doing Right? Amid the hand-wringing over the parlous state of U.S. education, experts suggest that successes demonstrate that lasting reform will require constellations of effort, not just stars.